Our unique range of Custom Made Car Seat Covers protect your vehicle from wear, burns, spills, marks and pet hair. Available in front and rear format, custom made in your choice of colour and to your specification. We also have a dedicated website which specialises in Semi Tailored and Fully Tailored Car Seat Covers, Boot Liners, Dog Mats and the like. The Highest quality custom car seat covers are now available to you via us at CoverYourCar Simply choose your make and model of car & choice of colour. 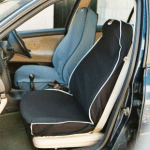 Protect your back seat from scuffing and bruising caused by Baby Seats. Secures around the back seat headrest and fits under the baby seat. Machine Washable. One size fits all. Available in Black only. Hair, mud, sand and grit will not penetrate this wonderful fabric. The cotton is very comfortable and helps reduce static. Protect the back of your front seats with this strong cover, muddy foot marks wipe off easily. Secures around the seat headrest and the crease of the seat. Machine Washable. Available in Black Only and sold individually. Keep front and back footwells free from mud. Easy to brush down or throw into the washing machine.